In 2004, Triconex safety expert Robert Adamski told me, “I’m going to share my nightmare with you.” He proceeded to talk about, not a safety issue, but a cyber security issue. He predicted that it would be possible to penetrate a control system and enter the safety instrumented system, the SIS, which is designed to safely shut down a plant in the event of a failure in the process. He explained exactly how his hacker, “Let’s call him Ali al Qaeda,” would be able to do that, and he dared me to tell him it couldn’t happen. Ever since then, I have been talking about Bob Adamski’s nightmare, and nobody has ever been able to tell me it couldn’t happen. The best they could do was to assert, pretty baldly, that it was highly unlikely, that it would require great resources, and would not happen because it would potentially cause extreme damage. Neither Adamski, who passed away a few years ago, nor I ever believed much in that argument, and we’ve been waiting for Bob’s nightmare to come true. Well, now it has. Not quite as badly as Adamski feared, and no plant was destroyed. But an attacker targeted an SIS system, and caused it to shut down the plant. The best description of what happened, and what the malware can do is in a blog by Heather MacKenzie of Nozomi Networks. You can read the entire blog here. She makes some important points. “The attack reprogrammed a facility’s Safety Instrumented System (SIS) controllers, causing them to enter a failed state, and resulting in an automatic shutdown of the industrial process,” MacKenzie wrote. What MacKenzie, and Nozomi Networks’ partner, Fireye, which discovered the exploit, says is that FireEye is moderately confident that the attacker inadvertently shutdown operations while developing the ability to cause physical damage. You can read their reasons for coming to this conclusion, and many other important details about the attack, in the FireEye blog post on TRITON. It is likely that if the target enterprise had been using another SIS system, the exploit would have targeted that one instead of the Triconex system. Now that the exploit has demonstrated that SIS systems as a class are penetrable and vulnerable, we can expect to see more attacks. “Cassandras” like Joe Weiss, myself, Eric Byres (of Tofino fame) and others have been pointing out for a decade that there is a thought gap between data security, which most cyber security systems are based on, and process safety. You cannot have a secure system unless it is a safe system. You cannot have a safe system unless it is a secure system. We can no longer ignore this fact or Bob Adamski’s nightmare will become all too real. If the Triton Exploit weren’t enough, the entire computing world was rocked in December and early January by the revelation that processors by Intel, ARM, AMD, and even Qualcomm (one of the largest manufacturers of mobile device processors) are vulnerable to a series of vulnerabilities, like Spectre and Meltdown, which leave them open to attack. How this impacts the automation industry is obvious. Since the major automation vendors abandoned making their own chips, almost forty years ago, chipsets by Intel, ARM, AMD and others have been used in everything from sensors to controllers, to the computers that DCS and SCADA systems run on. The computers that serve as cloud servers are not immune either. A report from CNET describes the issue: “Researchers found two major weaknesses in processors that could let attackers read sensitive information that should never leave the CPU, or central processing unit. In both cases, attackers could see data that the processor temporarily makes available outside of the chip. Spectre and Meltdown (which targets cloud servers) can be used on systems that are not patched to prevent it, to permit unauthorized entry into the system. Now, it is in the industrial space that systems will potentially NOT be patched. This is because in many cases, the system cannot be shut down to patch it, or the system is running on an archaic processor. There are thousands of Windows XP systems running in the industrial environment. There are instances of even Windows 3.11 and DOS systems running processes yet today. These systems cannot be patched. Intel and the others state that the flaw has existed for at least twenty years, so all those archaic systems are vulnerable. As the Triton Exploit and others have proven, hackers up to and including nation states, have been trying to penetrate Industrial Control Systems for at least a decade and a half already. This just gives them another avenue to exploit. And as the ICS malware exploits we have already seen show, it is not all that difficult to attack a control system that is not adequately defended. Operating system manufacturers like Apple and Microsoft are scrambling to patch their systems so that the exploits cannot be used. But the fact that it exists in nearly all processors means that it will be hanging over us for a long time. In the meantime, be wary of phishing and other means of achieving entry into your control systems. Be afraid. Be very afraid. This first appeared in the December 2017 INSIDER. If you like this kind of reporting and analysis, please consider becoming an INSIDER subscriber. Visit http://www.spitzerandboyes.com/insider for more information. This entry was posted in Automation and Process Control INSIDER, control automation, Cyber Security, David W Spiter's E-zine, Process Safety, safety instrumented systems, Schneider Electric, Triconex, Walt Boyes' Blog and tagged #cybersecurity, #pauto, Automation, SIS on January 28, 2018 by Walt Boyes. Flowmeters typically contain multiple components that introduce error into the flow measurement system. A simple flow measurement system may be comprised of a primary flow element and a transmitter that processes signals from the primary flow element. Sometimes, the primary flow element and transmitter are physically integrated together as one piece, such as in potable water meters. More complicated flow measurement systems may include multiple components such as a flow computer or other electronic components that compensate for process pressure, process temperature, or other parameters. It should not be forgotten that flow measurement systems are “systems” that measure flow. As an example, consider a hypothetical primary flow element that exhibits no error while the transmitter exhibits 5 percent accuracy. In this exaggerated example, the accuracy of the flow measurement system will be 5 percent. Assuming that the flow measurement error is that of the primary flow element only is an error of omission. Users should constantly be on guard to identify this type of error. In most flowmeters, the primary flow element and transmitter are integrated electronically. For example, the wetted primary flow elements of Coriolis mass flowmeters, thermal flowmeters, and magnetic flowmeters are virtually useless without transmitters that contain their respective flow measurement algorithms and drivers. Therefore, flowmeter performance typically includes the combination of a primary flow element and a transmitter. Further, the performance of most flowmeters is predicated on the calibrated output that is usually the pulse/frequency output of the transmitter. However, most process control applications of flowmeters involve the use of an analog output such as 4-20 mA to represent 0-100 percent of the desired flow rate. The analog signal is typically generated using circuits that convert the pulse/frequency signal (or its source) to an analog signal. This conversion introduces a measurement error that is constant throughout the signal range, so it can usually be expressed as a percent of full scale. The error introduced is typically between 0.03 and 0.10 percent of full scale depending upon the quality of the converter. To obtain the measurement accuracy of the analog output, this error is mathematically added to the accuracy of the flowmeter. The analog output error may seem small, but at low flow rates, this error can become significant and actually dominate measurement accuracy. For example, consider a vortex shedding flowmeter that can operate from 10 to 100 units per minute with 0.75 percent of rate accuracy but has an analog output accuracy of 0.10 percent of full scale. At 10 units per minute, the pulse/frequency output has an accuracy of 0.75 percent of rate, whereas the analog output contributes an additional (0.1*100/10) or 1.00 percent rate error, so the measurement accuracy of the analog output is 1.75 percent of rate. Most suppliers calibrate the pulse/frequency output. They typically state its accuracy as the performance of the flowmeter. The accuracy of the analog output conversion is often buried in the specifications in the fine print. Sometimes, it is not published and must be requested from the supplier. Sometimes the information is forthcoming, but often suppliers do not understand the question and try to state the analog output resolution (say 1 part in 4096, or 0.02 percent) as the analog output accuracy. After further investigation, many suppliers will admit that they do not know the analog output accuracy — even though most of their customers may use that output exclusively for their flow measurements. They also provide further enlightenment when they say that “no one ever asked for this before”. The burden of obtaining the best flow measurement possible in a given application does not lie with the supplier — it lies with the user. Do not forget the fine points that may lurk in the details and the errors of omission that may be available for the asking. 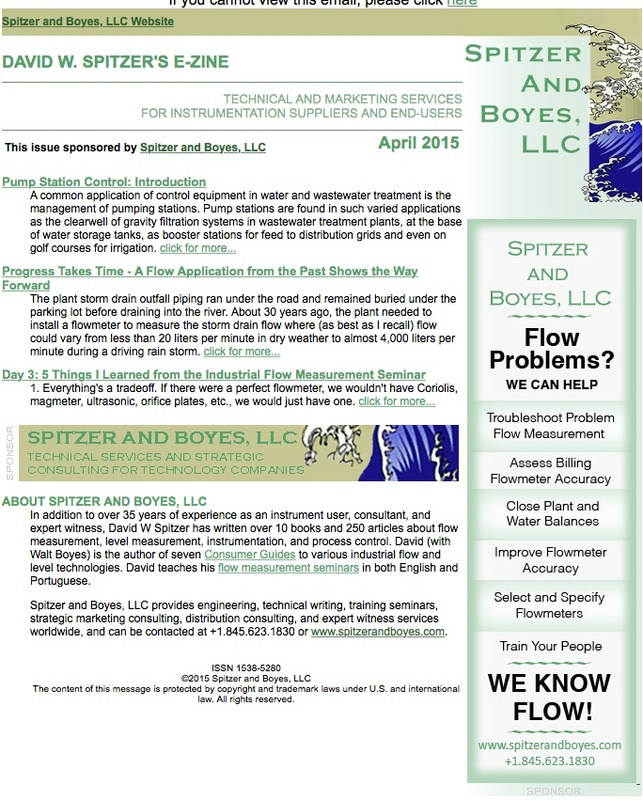 This article originally appeared in Flow Control magazine (September 2004) at www.flowcontrolnetwork.com. This entry was posted in David W Spiter's E-zine and tagged accuracy, Analog output accuracy, Analog output error, Flow Measurement, Flow measurement system, Flowmeter Performance on January 22, 2018 by David W Spitzer. Getting the most out of vendors is a challenge facing all who are active. There are techniques that you can use whether you are trying to get the best service at the local print shop or detailed information on a flowmeter. You will certainly be able to use your own experience to add to the tactics presented here. Before you even think about calling the vendor, you need to determine what it is that needs to be done. For example, if a flow measurement is not stable, you may want to observe the effect(s) of putting the control loop in manual. This ensures that the valve operates smoothly. You may also want to observe other measurements (such as pressures, temperatures, and flows) that affect the flow through the flowmeter. Vendors are trained to do certain things well, but troubleshooting your proprietary process or addressing internal politics is usually not among them. Vendors should know about the equipment that they sell, but even the best will stumble when asked to solve problems outside of their areas of expertise. Further, they potentially risk legal consequences if something should go terribly wrong. Who should you call once you have determined that contact with the vendor is needed? Try to determine who has the information or who controls the resources that you need and call that person. If you do not know who this is, try to determine who would know who that person is and their contact information. This may be your local representative, but it could be your supervisor or a technician who previously needed similar information from the vendor. For example, significant delays can be avoided by directly contacting the factory person who schedules field technical service instead of leaving a message for your local representative who is only in the office for two hours on Friday and will return the call during the next week. Understand what the vendor does and does not do. As previously mentioned, vendors should know about the equipment that they sell. Do not expect them to solve all of your problems. They may know a lot about widgets and have extensive related experience, but they sell products and they do not work for you. If you force vendors into the position of solving your problems, they may (reluctantly) do so, but their solution will usually entail the minimum of their effort and the minimum of their cost to successfully sell their product. For example, an instructor related a story about a contactor that had a 10 horsepower motor for installation on a fan that only needed a 3 horsepower motor. The instructor (who taught motor efficiency) knew that the energy consumption of the 10 horsepower motor would be higher and made him install the 3 horsepower motor. Installing the 10 horsepower motor was the easy way out for the contractor because he could “unload” a motor that he would probably not be able to use — and he was not paying the electric bill. Be sure that you completely and honestly communicate with vendors in a clear straightforward and respectful manner. Vendors are indispensable in solving certain problems, so not acting in this manner today may return to haunt you tomorrow. Given the comments above, there is nothing wrong with respectfully asking a vendor for referrals to find people who might be able to help solve the problem at hand. As a last resort, carry a stick. Sometimes vendors (like all of us) need a little push. Over the years, I reluctantly called a few supervisors and contacted the factory for information that was not forthcoming locally. There is always the threat of curtailing future sales, but with certain products, this approach can be a double-edged sword. In summary, vendors are people who should be contacted and used to perform work that supplements your work within their areas of expertise. You and the vendor should work together respectfully, and the vendor should not be asked (or forced) to perform your work. This article originally appeared in Flow Control magazine (August 2004) at www.flowcontrolnetwork.com. This entry was posted in David W Spiter's E-zine and tagged instrumentation, instrumentation vendor, vendor, vendor partnership on January 10, 2018 by David W Spitzer. Many of the above terms do not have clear meanings. In addition, discussions with suppliers revealed different meanings for specifications that otherwise seemed to be clear and well defined. Regardless of the terminology used by the supplier, the reader is advised to confirm exactly what the meaning of the terms used in the specification in order to understand them correctly so as to correctly evaluate performance. More importantly, the performance specifications may not describe performance. Consider some examples that were actually encountered. These examples illustrate the difference between published specifications and their actual meaning. From the above data set, it would be conservative to assume that statements expressed as percentages are percentages of the maximum sensor range until they are confirmed otherwise by the supplier. This entry was posted in David W Spiter's E-zine and tagged accuracy, Accuracy Statement, level gauge, Level Measurement, Level Measurement System on December 1, 2017 by David W Spitzer. In order to fairly compare performance, the same type of accuracy statement should be used for each level measurement system. For level measurement, the best measure of performance is usually the absolute (fixed) level error statement because it quantifies the amount of error expected to be present. Therefore, in most cases, statements should be expressed or converted to an absolute (fixed) level error statement before using the information for comparison purposes. Note the significant variation in absolute errors associated with the different error statements above. The preponderance of error statements used by suppliers will be discussed in Part 3. This entry was posted in David W Spiter's E-zine and tagged accuracy, level gauge, level gauge performance, measurement on November 28, 2017 by David W Spitzer. The purpose of installing a level measurement system is to measure level accurately in a reliable manner. Whereas issues dealing with physical properties, process parameters, electronic features, and interconnections are often considered extensively, the quantification of the expected measurement quality of the installed level measurement system can be virtually neglected. Often, relatively little emphasis is given as to how well the level measurement system will perform its intended purpose. Adding to the confusion are the differences in the manner in which performance is expressed and the incomplete nature of the available information. Nonetheless, the quality of level measurement should be a prime concern. The remaining performance statements will be described in Part 2. This entry was posted in David W Spiter's E-zine and tagged accuracy, level gauge, level gauge performance, measurement on November 21, 2017 by David W Spitzer. Did you ever wonder what it would be like to be a billionaire? If nothing else, it sounds like an exciting lifestyle. But how would you like to be a billionaire stranded on a desert island? In this situation, all of the money in the world will not help you survive. You may be wondering what this has to do with flow measurement. Simply put, it has a lot to do with turndown. Turndown is the ratio of the maximum flow rate that a flowmeter can measure within a stated performance to the minimum flow rate that the flowmeter can measure within a stated performance. Without getting into the subtleties of performance statements, this ratio can often be large. How many times have you heard vendor claims of “up to 40:1” or “up to 100:1”? The key operative words here are “up to”. Interpretation of these statements means that you may achieve as high as 40:1 or 100:1, but the flowmeter could provide 4:1 or 10:1 (or less) and still be within the limits of the claim. For example, magnetic flowmeters can typically measure the flow of a liquid traveling at a velocity of 30 feet per second. In slurry service, velocities above about 15 feet per second are sometimes recommended to prevent solids from accumulating. However, at these velocities, energy costs can increase and the pipes generally wear more rapidly. Therefore, in typical process applications, liquid velocities of 6 to 8 feet per second are more common. In another example, it is common for ultrasonic flowmeters to accurately measure velocities from approximately 1 to 40 feet per second. This means that such a flowmeter can have a turndown of “up to 40:1”. This may sound great, but in a typical application, only about 6:1 or 8:1 turndown would be achieved because the full scale flow is typically 6 to 8 feet per second. In short, the stated maximum turndown is based upon a range of flow rates (8 to 40 feet per second) that will not be encountered. Conversely, piping systems for abrasive liquids are often designed to operate at much lower velocities to reduce abrasion. Maximum flow rates in these applications can be as low as 2 feet per second (or lower). It the above ultrasonic flowmeter applied to this application, the flowmeter would operate accurately over a turndown of only 2:1. This turndown is far from the 40:1 turndown implied by its “up to 40:1” specification. When selecting a flowmeter, be sure that you define the turndown that you need, determine the turndown that the flowmeter will provide based upon the actual flow rates or velocities encountered, and then make your decision. One more thing — be sure to stay away from desert islands where you might get stranded. Originally published in Flow Control magazine. 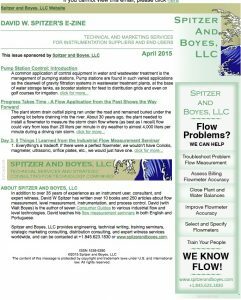 This entry was posted in David W Spiter's E-zine and tagged Flowmeter, Flowmeter Performance, turndown on November 15, 2017 by David W Spitzer. Can You Believe Performance Statements For Level Gauges? seem to be far from consistent. defined published specifications reflected the supplier’s intentions. specifications to use standard terms that describe level gauge performance? This entry was posted in David W Spiter's E-zine and tagged accuracy, level gauge, performance specifications, performance statement on November 10, 2017 by David W Spitzer.